We have a deep respect for nature and the environment, and believe that a great wedding or event does not have to cost the earth. It is possible to have style and sustainability. Naturally Chic was created, in part, to assist clients in making ecologically responsible choices while planning beautiful and stylish events. Moreover, we believe that going “green” is about making lifestyle choices beyond weddings or events that positively impact the planet. Naturally Chic is committed to helping clients make eco- friendly, socially responsible choices big or small. Going green is a process and anyone can take steps to reduce their impact on the environment. By incorporating green elements and making choices to lessen the overall impact of our weddings and events, we can help preserve the earth for future generations. We believe that every effort, even small initiatives, can affect a positive change. Weddings and events provide a unique opportunity for individuals and companies to showcase their values and commitment to a more sustainable lifestyle. As an eco-friendly certified company*, Naturally Chic adheres to the “Reduce, Reuse and Recycle” principles. We also encourage our clients to partner with businesses that have fair business practices and a commitment to the environment. Naturally Chic is committed to helping clients make eco- friendly, socially responsible choices big or small. Going green is a process and anyone can take steps to reduce their impact on the environment. By incorporating green elements and making choices to lessen the overall impact of our weddings and events, we can help preserve the earth for future generations. As an eco-friendly leader in our industry, Naturally Chic is committed to our continual education of sustainable initiatives that we can all practice to help make our society and world a better place. Naturally Chic is pleased to donate a portion of our profits to environmental and social projects. 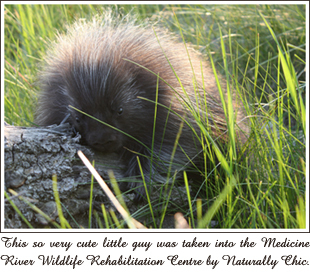 As wildlife enthusiasts, a couple of our favorite organizations include the World Wildlife Federation of Canada and the Medicine River Wildlife Centre. We select other projects and programs to support on an ongoing basis and will report about them on our blog. We are also pleased to choose organizations suggested by our clients. We also ask our clients if they would like to make a contribution of their own to their favorite organization. *We have an eco-friendly certification from the Wedding Planners Institute of Canada and are a preferred Green Bride Guide Vendor.